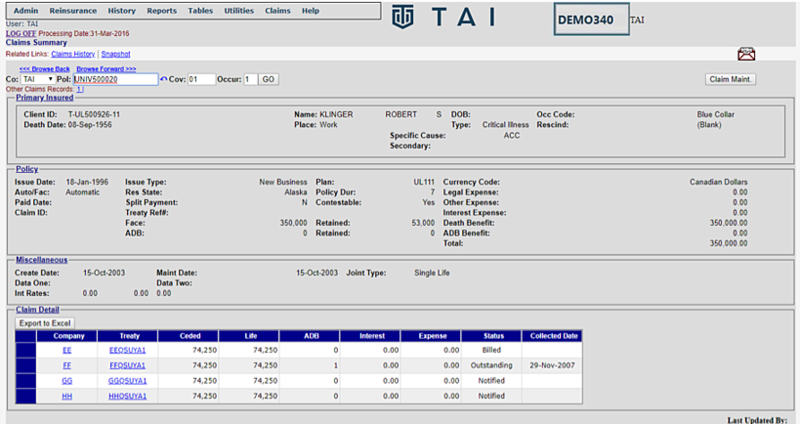 How can TAI users benefit from the Claims Module? Can the module be used to process claims for reinsured living benefits? Yes, the TAI Claims Module can be used to process living benefits which is performed in the Living Benefits History (Figure A) and Living Benefits Maintenance Screen (Figure B). This can help improve operational controls and efficiency by automating the recurring claims and pulling the information directly from the claims admin system. Can the module be used to administer accelerated benefits? Yes, the TAI Claims Module can be used to administer accelerated benefits which is performed in the screen below (Figure C). These types of products are becoming more prevalent in the industry and require unique handling based on reinsurance arrangements, which can be processed in the Claims module with a combination of existing functionality and custom modifications. Can critical illness claims be administered in the TAI Claims Module? Yes the module can be used to administer critical illness claims and is performed in the following screen (Figure D). 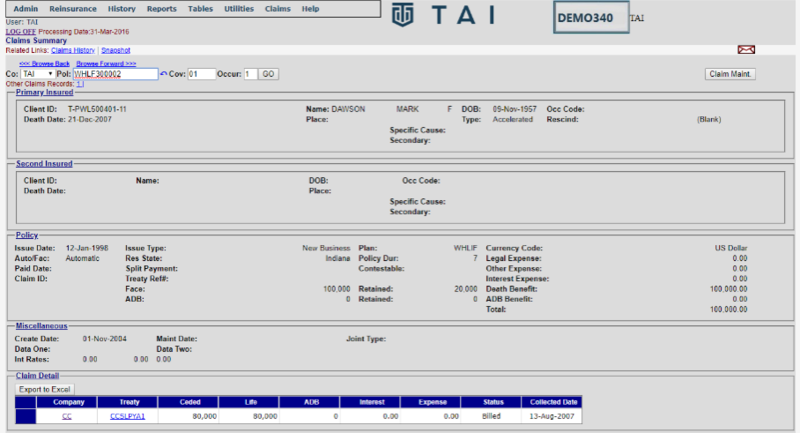 Can TAI .NET pull claims data directly from a claims system? 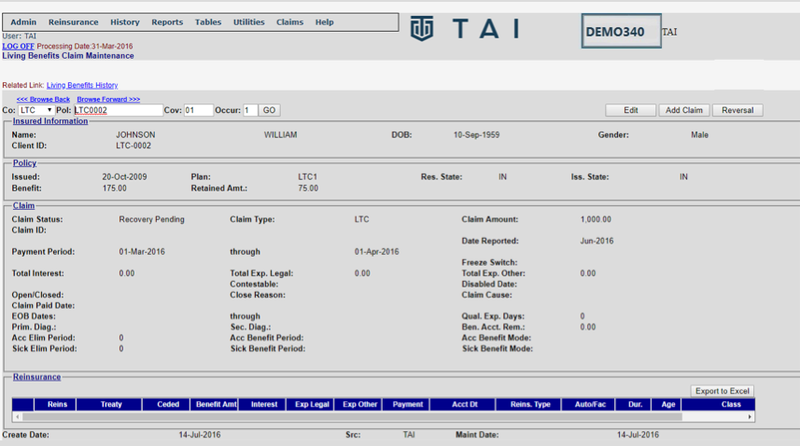 Yes, the most efficient way to use the TAI Claims Module is to have the TAI support team set up a connection between your claims system and TAI so the data feeds directly into it. This eliminates the need to wait for manual data pulls which inherently speeds up the process. What is the Claims EDI Extract? The Claims EDI Extract is a comprehensive data feed for both insurers and reinsurers. It helps streamline claims reporting by eliminating the need for paper notices, reducing the risk of missing data, improving data quality and facilitating open and pending claim reconciliation. What is the Claims Reimbursement Extract? The Claims Reimbursement Extract is an electronic recording of payments which automates and enhances the tracking of collected claims. It supports all types of claims, eliminates the claim payment screen and helps improve timely reporting of payments. Is an upgrade required to gain access to Claims EDI Extract and Claims Reimbursement Extract? No, an upgrade is not required to gain access. It is a small project and does not have a huge cost associated with it. They can be applied to either Mainframe or TAI .NET. If you have 3.4, you already have these enhancements on your system.